His birthday (14 December 1895) was the 34th anniversary of the death of his great-grandfather, Albert, Prince Consort. Uncertain of how the Prince Consort's widow, Queen Victoria, would take the news of the birth, the Prince of Wales wrote to the Duke of York that the Queen had been "rather distressed". Two days later, he wrote again: "I really think it would gratify her if you yourself proposed the name Albert to her". Queen Victoria was mollified by the proposal to name the new baby Albert, and wrote to the Duchess of York: "I am all impatience to see the new one, born on such a sad day but rather more dear to me, especially as he will be called by that dear name which is a byword for all that is great and good". Consequently, he was baptised "Albert Frederick Arthur George" at St. Mary Magdalene's Church near Sandringham three months later. [မှတ်စု ၁] Within the family, he was known informally as "Bertie". His maternal grandmother, the Duchess of Teck, did not like the first name the baby had been given, and she wrote prophetically that she hoped the last name "may supplant the less favoured one". Albert was fourth in line to the throne at birth, after his grandfather, father and elder brother, Edward. From 1909, Albert attended the Royal Naval College, Osborne, as a naval cadet. In 1911, he came bottom of the class in the final examination, but despite this he progressed to the Royal Naval College, Dartmouth. 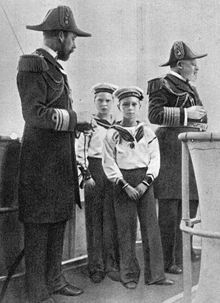 When his grandfather, Edward VII, died in 1910, Albert's father became King George V. Edward became Prince of Wales, with Albert second in line to the throne. Albert spent the first six months of 1913 on the training ship HMS Cumberland in the West Indies and on the east coast of Canada. He was rated as a midshipman aboard HMS Collingwood on 15 September 1913, and spent three months in the Mediterranean. His fellow officers gave him the nickname "Mr. Johnson". One year after his commission, he began service in the First World War. He was mentioned in despatches for his action as a turret officer aboard Collingwood in the Battle of Jutland (31 May – 1 June 1916), an indecisive engagement with the German navy that was the largest naval action of the war. He did not see further combat, largely because of ill health caused by a duodenal ulcer, for which he had an operation in November 1917. In February 1918, he was appointed Officer in Charge of Boys at the Royal Naval Air Service's training establishment at Cranwell. With the establishment of the Royal Air Force two months later and the reassignment of Cranwell from Admiralty to Air Ministry responsibility, Albert transferred from the Royal Navy to the Royal Air Force. He was appointed Officer Commanding Number 4 Squadron of the Boys' Wing at Cranwell until August 1918, before reporting to the RAF's Cadet School at St Leonards-on-Sea. He completed a fortnight's training and took command of a squadron on the Cadet Wing. He was the first member of the royal family to be certified as a fully qualified pilot. 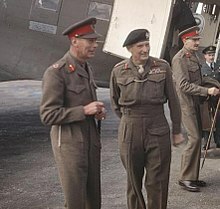 Albert wanted to serve on the Continent while the war was still in progress and was pleased to be posted to General Trenchard's staff. On 23 October he flew across the Channel to Autigny. For the closing weeks of the war, he served on the staff of the RAF's Independent Air Force at its headquarters in Nancy, France. Following the disbanding of the Independent Air Force in November 1918, he remained on the Continent for two months as an RAF staff officer until posted back to Britain. He accompanied the Belgian monarch King Albert I on his triumphal reentry into Brussels on 22 November. Albert qualified as an RAF pilot on 31 July 1919 and was promoted to squadron leader the following day. In October 1919, Albert went up to Trinity College, Cambridge, where he studied history, economics and civics for a year, with the historian R. V. Laurence as his "official mentor". On 4 June 1920, he was created Duke of York, Earl of Inverness and Baron Killarney. He began to take on more royal duties. He represented his father, and toured coal mines, factories, and railyards. Through such visits he acquired the nickname of the "Industrial Prince". His stammer, and his embarrassment over it, together with his tendency to shyness, caused him to appear much less impressive than his older brother, Edward. However, he was physically active and enjoyed playing tennis. He played at Wimbledon in the Men's Doubles with Louis Greig in 1926, losing in the first round. He developed an interest in working conditions, and was President of the Industrial Welfare Society. His series of annual summer camps for boys between 1921 and 1939 brought together boys from different social backgrounds. The Duke and Duchess of York had two children: Elizabeth (called "Lilibet" by the family), and Margaret. The Duke and Duchess and their two daughters lived a relatively sheltered life at their London residence, 145 Piccadilly. They were a close and loving family. One of the few stirs arose when the Canadian Prime Minister, R. B. Bennett, considered the Duke for Governor General of Canada in 1931—a proposal that King George V rejected on the advice of the Secretary of State for Dominion Affairs, J. H. Thomas. 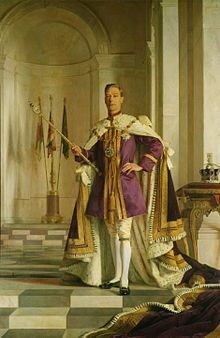 George VI holds the Sceptre with the Cross, containing the 530-carat Cullinan I Diamond. The Imperial State Crown is on the right. Portrait by Sir Gerald Kelly. King George V had severe reservations about Prince Edward, saying, "I pray God that my eldest son will never marry and that nothing will come between Bertie and Lilibet and the throne." On 20 January 1936, George V died and Edward ascended the throne as King Edward VIII. In the Vigil of the Princes, Prince Albert and his three brothers took a shift standing guard over their father's body as it lay in state, in a closed casket, in Westminster Hall. 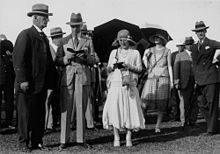 In May and June 1939, the King and Queen toured Canada and the United States. From Ottawa, they were accompanied throughout by Canadian Prime Minister William Lyon Mackenzie King, to present themselves in North America as King and Queen of Canada. George was the first reigning monarch of Canada to visit North America, although he had been to Canada previously as Prince Albert and as Duke of York. Both Governor General of Canada Lord Tweedsmuir and Mackenzie King hoped that the King's presence in Canada would demonstrate the principles of the Statute of Westminster 1931, which gave full sovereignty to the British Dominions. On 19 May, George VI personally accepted and approved the Letter of Credence of the new U.S. Ambassador to Canada, Daniel Calhoun Roper; gave Royal Assent to nine parliamentary bills; and ratified two international treaties with the Great Seal of Canada. The official royal tour historian, Gustave Lanctot, wrote "the Statute of Westminster had assumed full reality" and George gave a speech emphasising "the free and equal association of the nations of the Commonwealth". In September 1939, Britain and the self-governing Dominions other than Ireland, declared war on Nazi Germany. George VI and his wife resolved to stay in London, despite German bombing raids. They officially stayed in Buckingham Palace throughout the war, although they usually spent nights at Windsor Castle. The first night of the Blitz on London, on 7 September 1940, killed about one thousand civilians, mostly in the East End. On 13 September, the King and Queen narrowly avoided death when two German bombs exploded in a courtyard at Buckingham Palace while they were there. In defiance, the Queen famously declared: "I am glad we have been bombed. It makes me feel we can look the East End in the face." The royal family were portrayed as sharing the same dangers and deprivations as the rest of the country. They were subject to rationing restrictions, and U.S. First Lady Eleanor Roosevelt remarked on the rationed food served and the limited bathwater that was permitted during a stay at the unheated and boarded-up Palace. In August 1942, the King's brother, Prince George, Duke of Kent, was killed on active service. 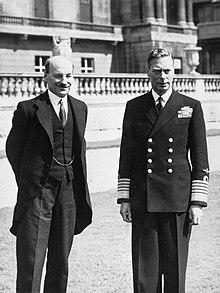 In 1940, Winston Churchill replaced Neville Chamberlain as Prime Minister, though personally George would have preferred to appoint Lord Halifax. After the King's initial dismay over Churchill's appointment of Lord Beaverbrook to the Cabinet, he and Churchill developed "the closest personal relationship in modern British history between a monarch and a Prime Minister". Every Tuesday for four and a half years from September 1940, the two men met privately for lunch to discuss the war in secret and with frankness. His elder daughter Elizabeth, the heir presumptive, took on more royal duties as her father's health deteriorated. The delayed tour was re-organised, with Elizabeth and her husband, the Duke of Edinburgh, taking the place of the King and Queen. The King was well enough to open the Festival of Britain in May 1951, but on 23 September 1951, his left lung was removed by Clement Price Thomas after a malignant tumour was found. In October 1951, Princess Elizabeth and the Duke of Edinburgh went on a month-long tour of Canada; the trip had been delayed for a week due to the King's illness. At the State Opening of Parliament in November, the King's speech from the throne was read for him by the Lord Chancellor, Lord Simonds. His Christmas broadcast of 1951 was recorded in sections, and then edited together. On 31 January 1952, despite advice from those close to him, the King went to London Airport[မှတ်စု ၂] to see off Princess Elizabeth, who was going on her tour of Australia via Kenya. On the morning of 6 February, George VI was found dead in bed at Sandringham House in Norfolk. He had died from a coronary thrombosis in his sleep at the age of 56. His daughter flew back to Britain from Kenya as Queen Elizabeth II. 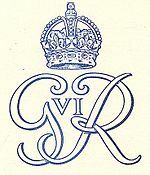 As Duke of York, George bore the royal arms of the United Kingdom differenced with a label of three points argent, the centre point bearing an anchor azure—a difference earlier awarded to his father, George V, when he was Duke of York, and then later awarded to his grandson Prince Andrew, Duke of York. As king, he bore the royal arms undifferenced. ↑ His godparents were: Queen Victoria (his great-grandmother, for whom his grandmother the Princess of Wales stood proxy); the Grand Duke and Grand Duchess of Mecklenburg (his maternal great-aunt and great-uncle, for whom his grandfather the Duke of Teck and his paternal aunt Princess Maud of Wales stood proxy); Empress Frederick (his paternal great-aunt, for whom his paternal aunt Princess Victoria of Wales stood proxy); the Crown Prince of Denmark (his great-uncle, for whom his grandfather the Prince of Wales stood proxy); the Duke of Connaught (his great-uncle); the Duchess of Fife (his paternal aunt); and Prince Adolphus of Teck (his maternal uncle). ↑ Renamed Heathrow Airport in 1966.